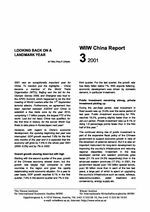 2001 was an exceptionally important year for China. To mention just the highlights - China became a member of the World Trade Organization (WTO), Beijing won the bid for the Olympic Games 2008, and Shanghai was host to the APEC Summit, which happened to be the first meeting of World Leaders after the 11th September terrorist attacks. Furthermore, an agreement has been reached between ASEAN and China to establish a free trade zone by the year 2010, comprising 1.7 billion people, the largest FTZ of the world. Last but not least, China has qualified, for the first time in history, for the soccer World Cup finals to take place in Korea/Japan next year. However, with regard to China¿s economic development, the upswing beginning in 2000 was interrupted. GDP growth reached 7.6% for the first nine months of 2001 and it is expected that the economy will grow by 7.4% in the whole year 2001 (2000: 8.0%) and by 7% in 2002.